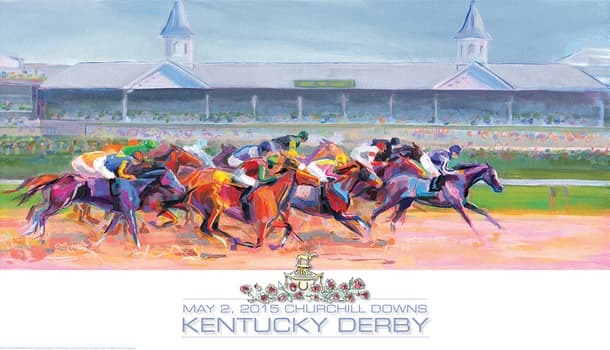 The 2015 Kentucky Derby is on Saturday, May 2nd 2015 at 5:30pm ET on NBC. Like every year – the Run for the Roses will be hosted at Churchill Downs in Louisiana, Kentucky. Easily the biggest horse race in North America and one of the biggest races in the world – the Derby is anticipated for months and ends in roughly two minutes, but we all still love it nonetheless. What Horses Have the Best Chance of Winning? American Pharoah (Best Odds: 11/4 at BetFred) is favored to win the race. He has won four graded races in a row, including the Gr. 1 Arkansas Derby and Gr. 2 Rebel Stakes during the prep season. This colt is fast and has a great post position on the outside, which should allow him to get ahead of the pack early. Distance won’t be a problem, but this will be the first real test for the splendid colt. Next up is Dortmund (Best Odds: 4/1 at Bet365) and that’s my pick. Dortmund is undefeated in six career races, including a win on April 4th in the Gr. 1 Santa Anita Derby. Dortmund is a durable colt that has shown he can win in under multiple circumstances. He has drawn gate 8, which has been a great spot to start the Kentucky Derby in recent years. Carpe Diem (Best Odds: 17/2 at Bovada) is a big horse with massive strides. He won the Gr. 2 Tampa Bay Derby and Gr. 1 Blue Grass Stakes this year, but he’s starting in gate 2, which isn’t ideal. The colt will likely get caught up in traffic as the horses with more pace will box him in and his closing speed won’t be enough to enter the winner’s circle. I like Materiality (Best Odds: 16/1 at Ladbrokes). Materiality will be starting in gate 3, but unlike Carpe Diem, this colt has early pace and should avoid getting stuck. Materiality has only raced this year, but he’s 3-0 with a win in the Florida Derby. What Horse Will Win the 2015 Kentucky Derby? There’s a lot of class in the 141st Kentucky Derby and you can’t go wrong with many horses in the field, but I’m sold on Dortmund. The colt is undefeated, has looked great all year and is very strong. American Pharoah has a chance to silence critics like me that believe this horse hasn’t been tested yet. There are a handful of other Kentucky Derby contenders that could win as well. These head-to-head prop bets are available at Bovada or Bodog. Firing Line has twice been right behind Dortmund, plus he won the Gr. 3 Sunland Derby. Frosted won the Gr. 1 Wood Memorial, but unless he continues to improve, this trip will prove too much for him. This one stood out to me as soon as I seen it. Mubtaahij has been shipped in from the UAE after winning the Gr. 2 UAE Derby, but I expect him to struggle against the locals at Churchill. Materiality is very fast and a horse I believe has a shot to upset the two favorites. Here’s another prop I like on Saturday. If you don’t like American Pharoah to win, but you’re not sure who will win, bet on the winning horse starting in gate 1-10 at Bovada. There are many more top contenders starting in gates 1-10. We have Dortmund, Carpe Diem, Materiality and Firing Line that all stand a good chance. Apart from American Pharoah – only Upstart and Itsaknockout worry me slightly.